EVERYTHING GOES! There will be no clothing restrictions. Hair, Make-Up & Tanning Allowed. Go Big or Go Home!! Pro-Am Routines Allowed FOR ALL AGES. WHAT ARE THE EVENTS IN THE PAGEANT? BEAUTY: All Contestants are required to participate in Beauty. Contestant ages 0-10 yrs old may wear a cupcake, short or long gown of choice. Girls ages 11-13 must wear a tea or floor length gown of choice. Ages 6 & Up will be required to do an onstage introduction before Beauty routine. 0-23 months, 3-4 years, 5-6 years, 7-8 years, 9-10 years, and 11-13 years old. WHAT ARE THE AWARDS AND TITLES? (1) MEGA GRAND SUPREME: This award will go to the ONE contestant that had the highest score in the ENTIRE pageant! 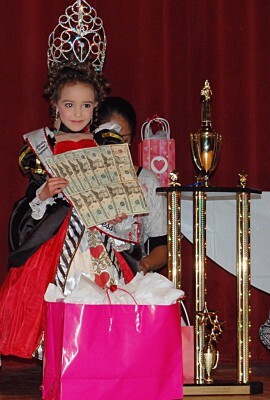 Winner will go home with Custom Crown, Large Gift & Custom Sash PLUS $300 CASH PRIZE!! (2) ULTIMATE GRAND SUPREME: This award will go to the two contestants with the highest score between Beauty & 2 Optionals. The winners will receive Crown, & Custom Sash! (6) DIVISIONAL QUEENS: A Beauty winner in each age division will be crowned Queen. Winner will receive Crown & Custom Sash. Runner-Ups will receive plaque. 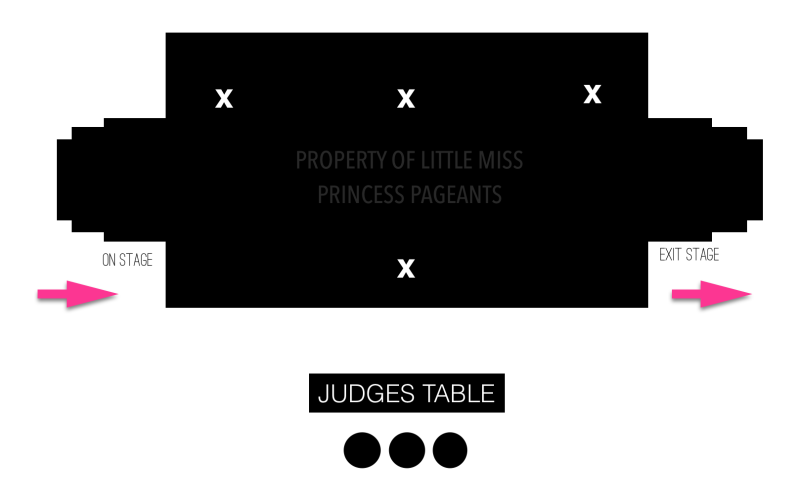 (1) DIRECTOR'S CHOICE: The contestant deemed an overall star by Little Miss Princess Pageants Director and staff enter in Director’s Choice will be named Director’s Supreme and pulled from age division. Winner will win Crown, Custom Sash and Large Gift Package. (4) OVERALL SUPREME WINNERS: The contestants with the highest score in Beauty, Theme Wear, and OOC, Photo categories will be pulled from age division and be crowned an Overall Supreme Winner receive Crown & Custom Sash. SIDE AWARDS: Divisional Winners will be announced for Pretties Eyes, Hair, Best Dressed, Best Personality And Best Smile. DON'T WORRY! YOU DON'T HAVE TO BE A SEASONED QUEEN TO GIVE THE OTHER COMPETITORS A RUN FOR THEIR MONEY. CONTACT ANA - THE DIRECTOR, FOR FUN AND AFFORDABLE TRAINING LESSONS. SHE OFFERS FACETIME, IN-PERSON AND GROUP LESSONS. FEEL FREE TO EMAIL HER FOR ANY FURTHER QUESTIONS. WHAT IS THE STAGE SETUP?